Conscience is the debut CD by reggae duo Benny Culture and Singie Shante. Performing combinations since 1998, their authentic old-world Jamaican values and reliance on God (Jah) come through strongly in their music and reflect their rural roots. 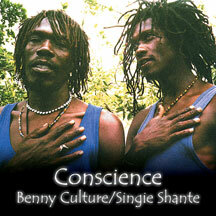 Until Benny Culture's untimely death in 2004, they were among the most positive voices coming out of the Caribbean. This 13-song set includes ten songs with The Gumption Band and three House remixes by U.S. DJ/producer The Groovematist.